What a follow-up to the Copper Promise! This second installment is utterly riveting and I’m very happy I’ve given the whole series a try after the conclusion of the first book, which felt a bit too much like standard fantasy Quest fare even if I had fun reading it. The characters are, uncompromisingly, one of the best features of this trilogy. 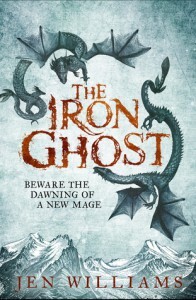 They are very intriguing and full of promise so what particularly worked for me in The Iron Ghost is that, along with nonstop action, the characters live up to their potential and more: some whom I've come to like are back, new ones join the party and the stakes are raised, building the plot toward a larger picture. The author isn’t shy about her characters either, dealing out hilarious and blood-curdling scenes alike and aplenty. The pace is relentless and quest by quest, battle after battle, the plot unwinds and knots again, a bit unconvincingly at times, but I was helplessly hooked. If you are big on world-building and narrative scope this, of course, is not the book for you; but if you want to savor a sword and sorcery (with a touch of epic) story with a fresh, straightforward approach and little off-colour morality, look no further. Wydrin had faced down a dragon, not to mention half the tavern owners in Crosshaven. She could take care of herself.